Are you interested in doing more work on your healing journey? 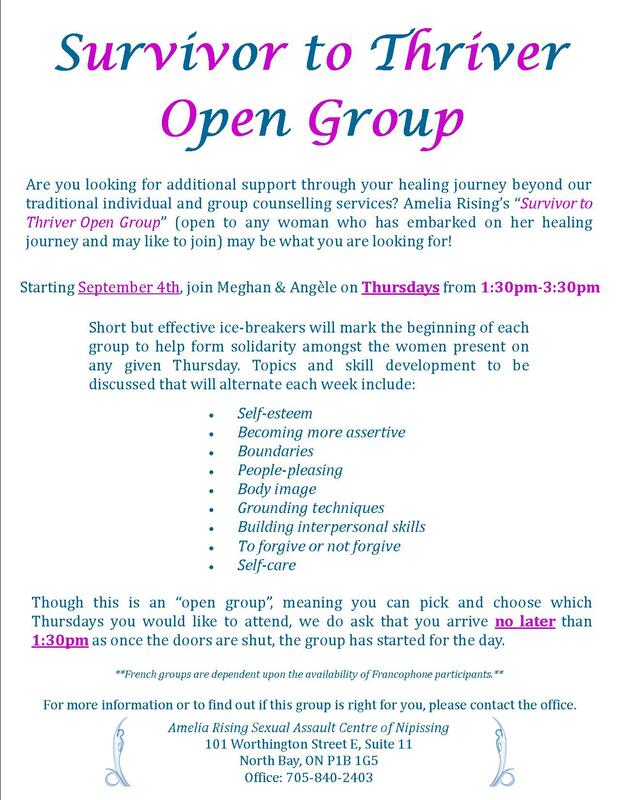 Join Stephanie on Thursday afternoons for Amelia Rising’s new “open” group (open to any woman who has embarked on her healing journey and may like to join). Small but effective ice-breakers will mark the beginning of each group to promote solidarity amongst the women present on any given Thursday. Though it is an “open group” (meaning you can pick and choose which Thursdays you would like to attend), we do ask that you arrive no later than 1:30p.m. as once the doors are shut, the group has started for the day. If you have any question, please call the office at 705-840-2403. The office will be closed Friday April 14, for Good Friday. If you are in crisis, please call our 24 Hour Crisis Line at 705-476-3355 (Collect Calls Accepted). Le bureau sera fermé vendredi le 14 avril, pour vendredi de Saint. Si vous êtes en état d’urgence, S.V.P. signaler notre ligne de secours 24 heures au 705-476-3355 (frais virés sont acceptés). Happy Easter everyone. We are closed Monday. upcoming events and empowering articles.